Select an option 16" 17" 18"
"The greatest gift we can give one another is rapt attention to one another's existence" -Sue Atchley Ebaugh. 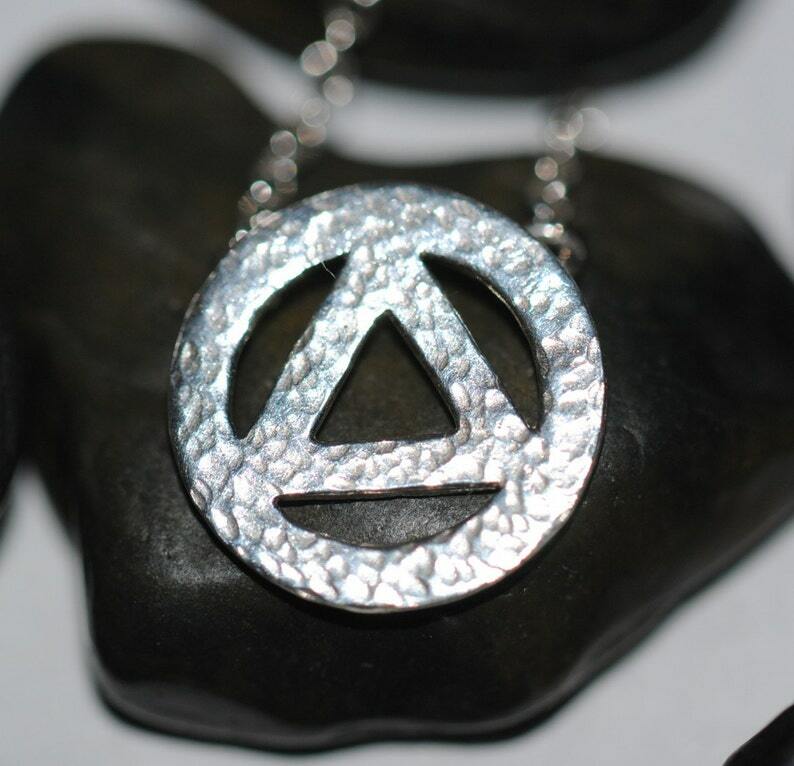 This sterling silver AA necklace is handmade, by me, using a jeweler's hand saw for cutting out the AA symbol, a hammer for texturing, and a torch for soldering. Pendant Size: Approximately 1/4" x 1/4". Length of Chain: Can be ordered in 16" through 18"
Each of my pieces are handcrafted, minimal details may vary. Any requests or suggestions - please feel free to contact me - I'm happy to accommodate if possible. I have yearned over this ring for a long time and finally decided to buy it. I was not disappointed! It’s beautifully crafted In silver and copper; utterly striking. If you have a tree fetish, as I do, this ring’s for you. It’s wonderfully organic and whimsical. A little bit tighter fit than I expected, but I wanted it for my index finger and I’m not used to sizing it. I ordered a half-size larger due to the wide band, but could probably have used a whole size. Still it’s a comfortable fit right over my knuckle and looks great on my hand. I love it! Item not exactly as I expected, but very nice. Naomi offered refund but I decided to keep it. Great customer service. I accept direct check out via Etsy, Paypal or check. Please note, that you can pay through Paypal without having an account. To use your credit card without opening a Paypal account choose the Paypal options and look for further instructions. The link below gives detailed information on paying with a credit card. If for some reason you are not satisfied, please notify me within 15 days of receiving the item for exchange or refund. Once your payment has been received your item will be shipped in 3 to 7 business days. If you need the iteam sooner, please convo me with your request and I will do my best to accommodate you. All US packages will be shipped USPS First Class mail along with a tracking number. All International Packages will be shipped USPS First Class mail along with a tracking number. If there is a problem in the sizing of a custom order, I will correct the problem and return your shipping coast.